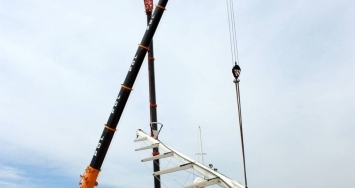 Sailing Yacht Asashi started her refit at STP with the spectacular unstepping of her mast. This superyacht's two aluminium masts, which bear a sail area of around 1.500m², are 58.8 m. (the main-mast) and 48.26 m. (the mizzen-mast) tall. That's why special cranes had to be brought from the mainland to unstep them. To be specific, the unstepping took two cranes of 350 and 200 tonnes respectively, in an operation that, as far as the height of the main-mast goes, was a "first" for Mallorca. Asashi is a sailing yacht of elegant and luxurious design which possesses a mixture of valuable, refined materials in her interior, including ebony, wenge, makassar and leather, that give her a natural, relaxing feel. She can accommodate up to 12 persons in 6 cabins. Her exterior includes a fine solarium and a very characteristic flybridge.